Shelti Yellow foosball for Shelti foosball tables! An indestructible urethane compound ball. Same hardness as the common high end Red Foosballs. 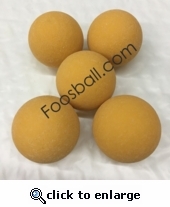 These balls are tumbled/scuffed to provide even more control. Quantity is for one ball.